Cleaning and rejuvenating paste for inking rollers; for removal of stubborn deposits on older inking rollers. 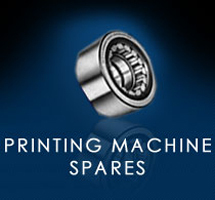 Occasional application on rollers removed from presses restores the ink transfer properties of glazed inking rollers. 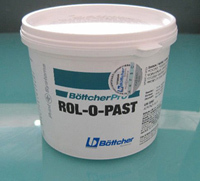 BottcherPro Rol-O-Past is a paste for deep cleaning of the surface of inking rollers in sheetfed and web offset presses. It is not recommended to clean the surface of dampening rollers. Clean the inking rollers in the press with a Bottcher roller wash and allow to dry. Remove the rollers from the press. Apply BottcherPro Rol-O-Past with a spatula to the roller surface to a thickness of approximately 3 mm. BottcherPro Rol-O-Past must remain on the roller covering for at least 3 hours. If ink residues are considerable, we recommend leaving the paste on the rollers overnight. BottcherPro Rol-O-Past can be removed from the roller with a blunt palette knife. Take care, that the roller surface is not damaged. Finally, the roller should be washed with water and dried thoroughly.